Former West Bromwich Albion boss Roberto Di Matteo returns to the Hawthorns with Chelsea today, looking to end what has been their worst run under his management; three games without a win. The recent bad spell has seen Chelsea slip to third in the Premier League table, from a position where they had been four points clear at the top. In fact, they start just two places and four points above Steve Clarke's side; who in comparison have made their best start to a top flight campaign since 1982. West Brom remain without first choice keeper Ben Foster this afternoon, and there are doubts also over Youssouf Mulumbu and Gareth McAuley - both suffering with hamstring injuries. Albion will also be without on loan forward Romelu Lukaku, who is ineligible to face his parent club Chelsea. Chelsea will be without captain John Terry, who they believe will be sidelined for up to three weeks after last weekend's nasty injury during the Liverpool game. David Luiz and Oscar will be assessed having played for Brazil midweek, while Frank Lampard and Ashley Cole are both still doubts. 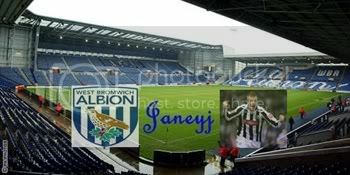 Baggies fans will undoubtedly remain confident of their sides capabilities this afternoon; they have taken 15 of a possible 18 points at The Hawthorns so far this season, with only current champions Manchester City taking points. Today they look for their first third successive win under new gaffer Steve Clarke; the last time Albion notched up three successive victories Chelsea were the third team in that sequence - a 1-0 victory at the Hawthorns which proved to be the final straw for then manager Andre Villas-Boas, who was sacked. Well just what can I say, we are looking pretty good at the moment. Defo Jane, fantastic result again!